Event Questions allow churches to ask customisable questions at the point when they're signing up for one of your events. With Event Questions you can capture all that extra essential information you need prior to the event, making event planning and management even easier. What can you use event questions for? For example, if you were putting on catering at one of your events; perhaps you need to know any special dietary requirements. Or maybe you're running a conference and you want to know what media format delegates want the conference material in. Or get really creative and solicit feedback on how people heard about the event or your church. Basically you can use Event Questions to capture any pre-event information you need from your event delegates in order to plan or deliver your event. When creating a new event in your calendar (or if you’re editing an existing event), there's a section in the Event Edit page located just below the visibility section. 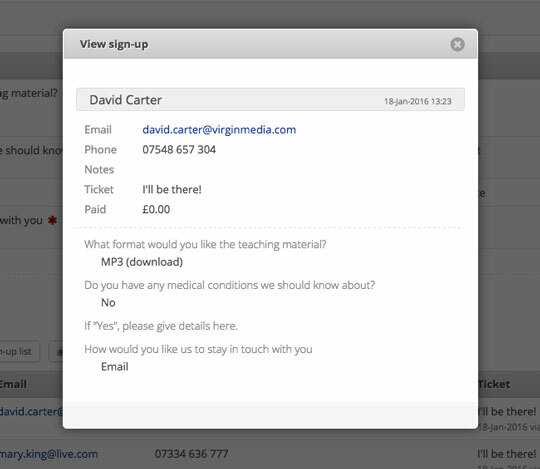 Here you can create event Tickets, or configure your Confirmation email. There's also a section for Questions. Click to add a question and enter your question in the space provided (max 250 characters, to avoid clipping). Next you can choose from a range of questions response types. Single sentence (free text) e.g. for a "dietary requirements" this response type is probably adequate. Paragraph response (free text) - ideal where longer explanations or answers are needed. Drop down list - you can create a defined list of choices from which a single response is selected. The first Option response is the default response. Check box list - you can create a defined list of choices from which multiple responses can be selected. Radio list - like drop-down list; you can create a defined list of choices from which a single response is selected. The first Option response is the default response. Date e.g. for gathering that all-important date of birth perhaps; but can be used to gather any date data you may require from your sign-ups. Date formats are region-specific. You can add multiple Questions to an Event, but bear in mind that adding too many questions extends the length of the booking page and might make signing up feel more like a questionnaire! 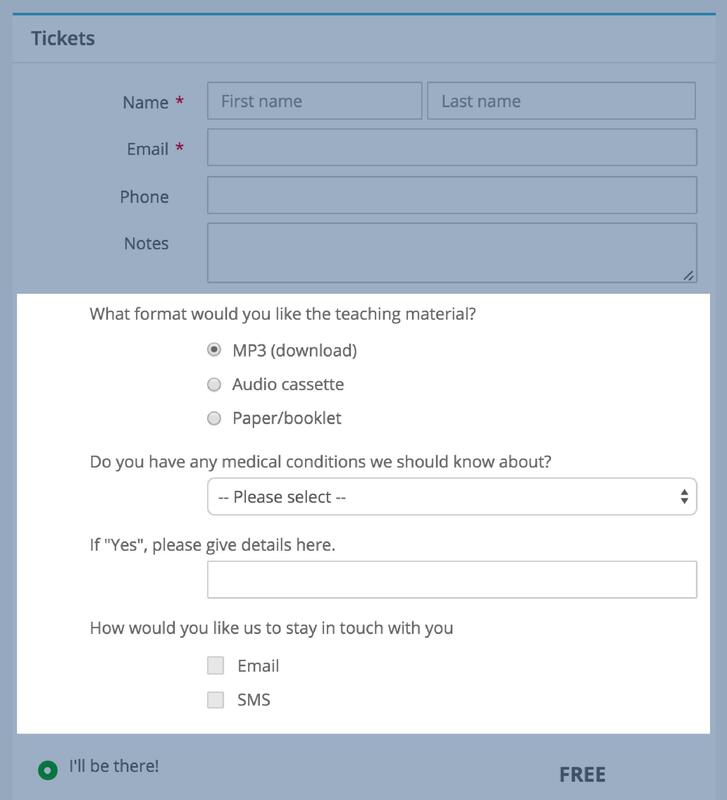 For each Question you can have the option to force a required response - remember therefore, with drop down list, check box list and radio list, to include an option for “N/A” or "None", if none of the options apply. Remember also to save your changes! Event Question responses are retained against each sign-up in your event sign-up list; so you can drill down to see individual responses to your questions. The question responses are also included in the body of any Event sign-up confirmation; emails that are sent to the person signing up, and to event overseers. Using the "Download sign-up list" option you can export a full list of sign-ups, tickets and event question responses in CSV file format. This report is helpful for event overseers and your events team, so they can plan or prepare accordingly. You can also filter the list of sign-ups using the "in-page" filters at the top of the list, perhaps to filter by ticket, payment status, where sign-ups are within your Address Book, Children module or not in ChurchSuite, and lastly by event question responses. Q When creating a new multi-date event, will my Event Questions get replicated to all dates in the sequence? A Yes, just like Event Tickets, Questions are created for each date in the multi-date sequence. Q My multi-date event is a discipleship course and I only need Sign-ups on the first date in the sequence. How do I do that? This is done simply by first creating your multi-date sequence without Tickets or Questions, and then going back to the first event in the sequence and adding in your Tickets and Questions. Tickets and Questions are not pushed to the other events in the sequence; even if "update entire sequence" is ticked. The "update entire sequence" functionality only extends to Name/Time/Visibility/Category/Description. Q I have existing multi-day events; can I add event Questions to these? A Yes, you can; but remember that you have to add Questions to each date manually. It is not possible to add them to one event and then update the entire sequence. If you wish to add Questions to every date in an existing multi-date sequence of events, you might consider re-creating the sequence and then remove the old one, but be careful not to delete any existing sign-ups. The quickest way to re-create an event is to use the "Duplicate event" feature in "Calendar" > "Events". Q If I change the Questions in one of the events in a sequence, will the change be reflected in the rest of the sequence? A No. As above, Event Questions can only be duplicated at the point of first creating a multi-date sequence to avoid potential loss of sign-up data. Adding, editing or removing questions has to be done manually on each date in the multi-date sequence. Again, when deleting Questions, be aware you will lose existing sign-up responses to that question.